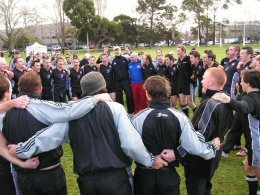 During the second International Cup, staged in Melbourne in August, World Footy News spoke with New Zealand AFL General Manager Rob Malone. Originally from Western Australia, where he played for West Perth in the WAFL (he also had a short stint at St Kilda), Malone has a professional background in football administration, including Football Manager at West Perth and General Manager at Claremont. During the train trip to Wangaratta we discussed the quality of the Kiwi team and the challenges facing the game. Their following game against Samoa confirmed for this author that Malone's rating of his squad was on the mark, as the Falcons demolished what was an otherwise competitive unit, before completing the tournament undefeated. Below is a transcript of the interview and a link to the audio, however the latter is relatively poor quality due to background noise levels on the train. We'll bring you further exciting news about NZ footy in the next few days. After all the preparation and build up to the big day, the Bakersfield club, US Footy's latest side, made their match debut. Other "local" Californian clubs joined them for their big day. This report from San Diego's Mike Russell (who travelled out and played on the day) with extra reporting by Brett Northey. Australia dusted up the Irish in more ways than one with a second emphatic victory in the second and final Test of the 2005 series in Melbourne. 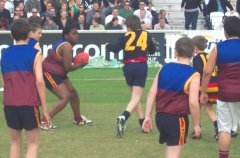 After a fabulous display of fast skillful International Rules football in Perth, the second Test was marred by a melee and plenty of scuffles after Australian and Brisbane Lions player, Chris Johnson, delivered a "coat hanger" tackle on Irish and Tyrone player Philip Jordan. Following the first test of the International Rules series in front of 39,000 at Subiaco in Perth, the second game will be played at the Telstra Dome in Melbourne on 28th October. The big win by the Australian team in the first test may have taken some of the sting out of the series, seeing the match slip back a couple of timeslots in NSW, QLD and the ACT, but this time around the game will get expanded coverage overseas. As part of the development of the FootyWiki - WFN is giving readers a sneak preview of the World Footy Atlas. The Atlas links into the FootyWiki, the World Footy Community's version of the Wikipedia, the online encyclopedia that anyone can edit. Visit the Atlas here to check out how it's working so far. Currently the maps are mainly at continent level (except North America), but as our writers and programmers have time, the level of detail will be extended hopefully to national level in countries with larger numbers of clubs. Once in the Wiki, if your club's (or anyone else's club's) information needs expansion or updating - read the User's Guide and add anything you think is relevant! After three successful years overseeing the continued rise of footy in the United States as USAFL President, Mark Wheeler has moved into the position of Australian Liasion, with Robert Oliver taking over the reigns of US footy. The USAFL National Championships in Milwaukee earlier this month was a huge weekend for footy in the land of the “stars and stripes” for not only the tremendous organizational efforts by the host club the Milwaukee Bombers but also it gave genuine notice that women’s footy had also found a place in the USA. The inaugural National Championship for Women’s footy took place with what was hoped to be four teams but ended up with three. However the intensity and desire for success was still very evident with the prestige of being crowned the first ever USAFL National Champions on the line.